Overly Thrilled About this Costume!! at how beautiful the costume really was. It fit like a glove. I was comfortable and could move easily in it. I even felt elegant. when I only chose standard shipping. Again, 100% satisfied and overly thrilled about! The only thing that didn't work like the picture was the stand up collar. I couldn't get it to stay standing. But that didn't bother me too much. These days, a lot of women's costumes are sexualized. I needed something to wear for my kids school and love the wholesomeness of this costume. Costume was a huge hit! This costume looked just like the photo! 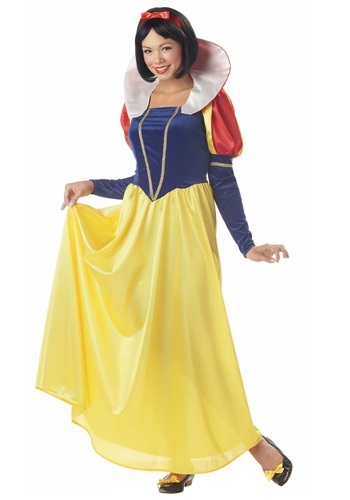 I wasn't sure since it was so inexpensive compared to some of the other costumes. Had to iron it to get the collar to stand up, but other than that it was perfect. Got tons of compliments, and everyone thought i spent way more money than i did. 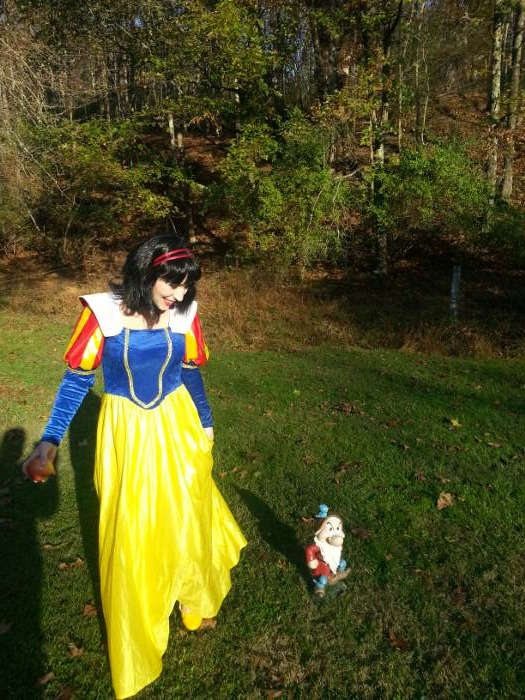 I was very pleased with the quality of the Snow White costume. Its wasn't cheap or looking like a street walker like many of the costumes I saw locally since I work in a elementary school so I wanted something G rated. Very happy with the purchase and I received alot of positive comments from teachers and students. I bought this dress for a princess themed birthday for my co-worker's daughter. I am certain she'll love it! It looks just as it does in the picture, except for the collar. The collar either stands up too much or flops down. I'm working on a way to fix that. My only other issue is that the chest and shoulders are just a bit too big for me (I ordered a medium), so some extra tailoring is also needed in that area. The package came a few days ahead of schedule, too, so that's an added bonus. Also: the yellow dress part is a bit see-through in certain light, so be cautious about your underwear choice! Great costume! Definitely worth the buy. Very cute costume for such a low price! I ironed the skirt and collar because they were really wrinkled and wouldn’t sit right. The costume was great after this—the collar stood up perfectly which made the costume look way more enchanting and Snow White-esque! The material is very thin and I ordered too big but I wore long underwear underneath and used fashion tape to keep the neckline looking neat and PG! I thought the costume fit great. I chose a size medium and I am 5’5” and 135 pounds. My only issue with the costume is that the yellow skirt part is a bit see-through. I simply wore a slip underneath the skirt. This costume was cute and affordable but you need to be built tall and slender. The sleeves were especially tight. I hope the 30 day return policy isn’t a problem. 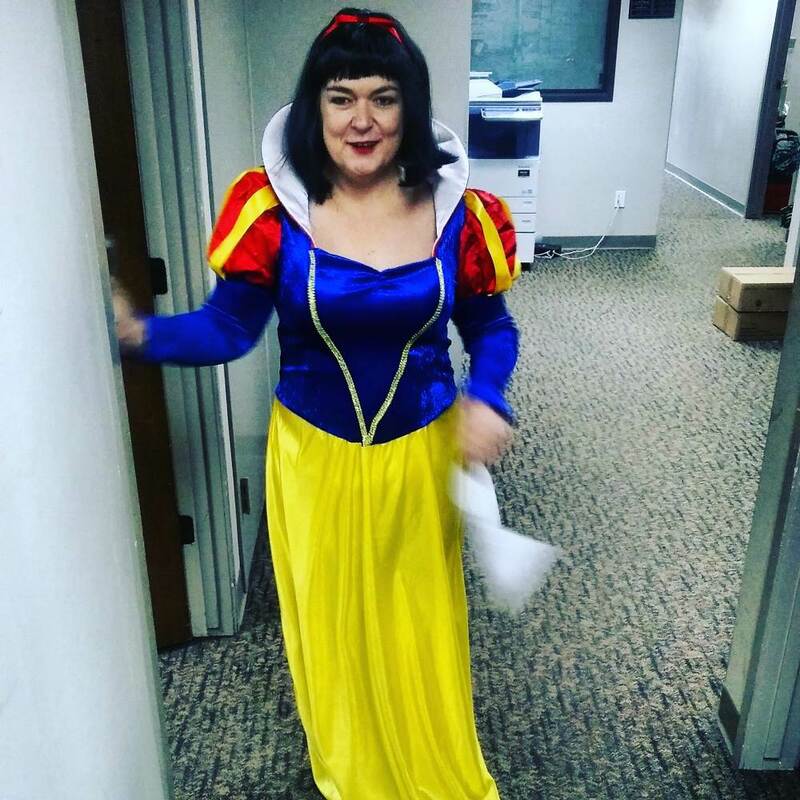 We had to buy a second Snow White costume at the last minute. Hi! Thanks for your input on the costume. I have alerted our returns dept. to make sure to accept the return, even though it is somewhat outside our 30 day returns policy. Best regards. Good quality and super cute costume. I wear a size 12 and the X-Large fit perfectly. Do not iron the stand up collar, there is plastic in there to give it stability and it got really hard when I applied heat. Low heat might be okay, I used high. Hair ribbon was a little frayed and kind of limp, I do wish I had ordered a cuter red bow but it still worked with the costume, just had to trim it. I had so many compliments. it is a beautiful costume; our snow white looked gorgeous. Good quality item. This costume was hard to find in store so I bought it here. It is good quality against others I have bought. The only issue I have is the white piece around the neck does not stand up like the picture. The issue with that is when you take the white part off you have two pieces of white velcro. Not sure how I will handle this....The sleeves look a little odd too.